Last week, new Final Fantasy XIII scans appeared in Japanese magazine V-Jump. And this week? Those same scans appear in the upcoming Famitsu. But, Famitsu being Famitsu, there are a few new scans — three, actually. 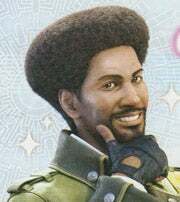 They're of Sazh Katzroy and his magnificent hairdo.